As our four-wheel drive taxi meanders along the narrow, winding road in the Himalayan foothills, ahead of us appear not one, but three delicate rainbows – a highly auspicious sign, according to the Tibetan Lama on board. Our group, led by Judy Arpana and Karma Lhundhup Rinpoche, is approaching McLeod Ganj, a suburb of Dharamsala in the Kangra district of the Indian state of Himachal Pradesh. The Tibetan government in exile’s headquarters are located here, along with the residence of Tibetan Buddhism’s spiritual leader, His Holiness the Dalai Lama. It’s a welcoming place for Tibetan refugees, and where those who manage to survive the treacherous and arduous escape from Chinese rule come to receive the blessing of the Dalai Lama and learn skills such as rug making, weaving and Buddhist statue making. It’s also a haven for those who wish to experience the Tibetan culture and for pilgrims wanting to pay homage to one of the most popular spiritual leaders on the planet. 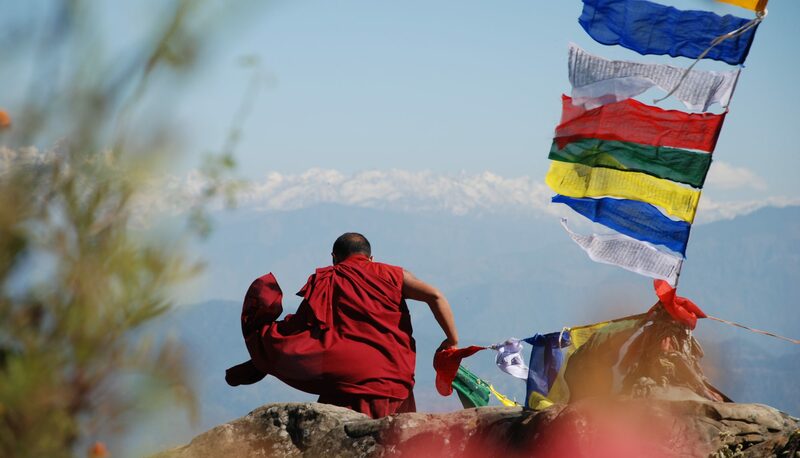 Over the next four days we immerse ourselves in all things Tibetan. There is much to see and we visit the Tibetan Children’s Village and School – a huge complex of many hectares, with live-in accommodation for more than 1700 students. Our hearts melt when we pop in on the toddlers sleeping in their bright painted cots. We were told many desperate Tibetans resort to using people smugglers to help their children escape from their homeland, so they may come here. They are taught in their own language about their unique culture, enjoy freedom to practise Buddhism and live with other Tibetans. Small family-run Tibetan restaurants serve traditional specialties such as momos – steamed dumplings filled with vegetables, chicken or buffalo topped with tomato chilli relish, thukpa – a vegetable noodle soup, toasted barley porridge, delicious pancakes and, of course, yak-butter tea. It’s not unusual to become part of a political discussion with young Tibetans in a coffee shop – film nights and debating nights are also held regularly. We make time to visit the community-owned Khawa Karpo Tibet Cultural Centre where skilled craftspeople demonstrate rug-making and weaving. For just over $200 (including postage home) we purchase stunning Tibetan rugs to remind us of our visit. Each morning at 7am we join the many Tibetans who make their way to the Dalai Lama’s complex to circumambulate his residence. Along the way they chant mantras and colourful Om Mani Padme Hung carved stones line the way. At the halfway point, prayers are offered along with a rousing chorus of the Tibetan national anthem. It’s very moving to see the devotion and spirit of these people who have had to flee their country. They make us welcome and smile broadly as we join them in their morning ritual. The streets of McLeod Ganj are filled with stalls offering a huge selection of Tibetan and Himalayan handicrafts. The locally made shawls are popular, along with jewellery and such oddities as yak bone carvings. Other ‘must see’ places include the Norbulingka Institute, which also houses the Dalai Lama’s Summer Palace. It includes a beautifully designed shop full of statues, clothing and handicrafts fashioned by Tibetans working in the complex. There is also an excellent cafe set among the Japanese-style gardens. The Tibet Museum is also worth a look: it is a potent reminder of the disturbing events since the Chinese invasion including personal photos and stories of tremendous endurance under terrible circumstances. But ultimately, visiting McLeod Ganj is an inspirational experience because of the strong presence of the resilient Tibetans and their undying optimism and devotion to their spiritual leader and their homeland.